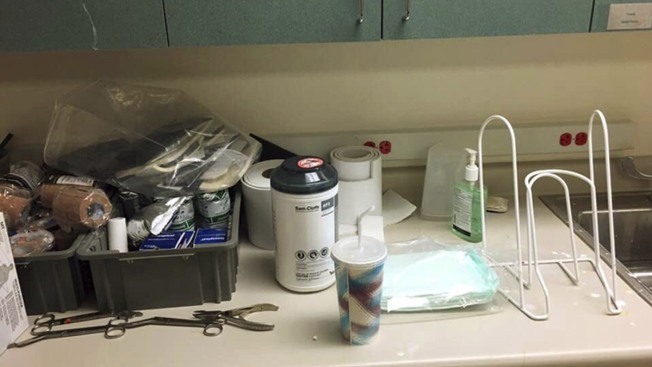 This undated photo provided by Christopher Wilson shows cluttered and unsanitary conditions that Wilson, an Army veteran, found in an exam room where he waited to be seen at a Veterans Affairs clinic in Salt Lake City. The VA is investigating why he was put in a room with an overflowing trash can and medical supplies strewn about. Dr. Karen Gribbin, chief of staff at the George E. Wahlen Department of Veteran Affairs Medical Center, apologized on Monday, April 30, 2018. "Mr. Wilson should not have been placed in the room in that condition," Gribbin said. A Veterans Affairs clinic in Salt Lake City is investigating why an Army veteran was put in a room with an overflowing trash can and medical supplies strewn about after the man's father tweeted images of the unclean space. Stephen Wilson, the father of Christopher Wilson who spent six years in the Army and was deployed to Iraq twice, posted the photos to Twitter on Friday, calling the sight "very unprofessional, unsanitary and disrespectful," the Deseret News reported. The post had been retweeted nearly 17,000 times as of Monday afternoon with about 2,400 comments about the photos and post. "The condition of the room was the way it was when he went in, no other room was offered and no attempt to clean it up was made for the duration of his appointment," Stephen Wilson also tweeted. Dr. Karen Gribbin, chief of staff at the George E. Wahlen Department of Veteran Affairs Medical Center in Utah, apologized on Monday and said at a news conference that the staff was focused on ending Christopher Wilson's wait on April 5 and didn't notice the state of the room. She said discipline is possible for staff members, but said they are still trying to understand what happened. "Mr. Wilson should not have been placed in the room in that condition," Gribbin said. "The room should be cleaned, supplies and trash removed, before the next patient is placed in there." Gribbin said she apologized to Christopher Wilson on Saturday and again Monday "for his experience." Christopher Wilson, 33, said he was at the facility to get 18 injections in his ankle and surrounding area.